On Sunday, September 30, 2018, the Majestic Community Choir celebrated its 40th Anniversary at Mason Temple Church, 6098 N. 35th Street. The Majestics celebrated with a huge concert with many special guests and speakers, including Way of the Cross pastor Rev. Kurt Boyd (upper photo, left). 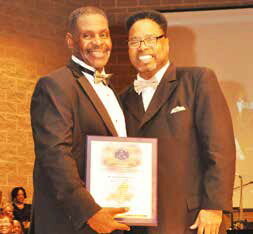 During the anniversary concert celebration, Majestics founder and director Joe V. Nathaniel, Jr. (inset, left), received an award from Prophet Earnest Hollins (inset, right), founder of Alternative-Christians United Ministries International in San Antonio, TX.